The EIB is committed to supporting economic and social changes in Mediterranean countries. Since January 2014, the EIB has signed off on €2.1 billion in investments across three key areas: encouraging private sector growth, developing socio-economic infrastructure and taking concrete measures for climate action. The EIB is convinced that growth generated by the private sector is the best way of initiating sustainable development in the Mediterranean Basin. One of its priorities is access to funding for SMEs. The EIB is helping boost regional growth and employment by giving these entrepreneurs the means of creating and developing their companies via loans or acquisition of equity to the amount of €565 million. In this way, it has contributed to funding the Microfund for Women in Jordan and granted €70 million of lines of credit to Tunisian banks to support very small, small and medium-sized enterprises. The EIB also supports the initiatives of Mediterranean partner countries seeking to increase investment in infrastructure, which is a real driver for sustainable development in the region. 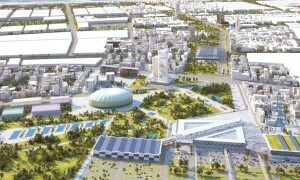 One example of this is the urban development of the new city of Zenata (€150 million) in Morocco, a project co-funded with the French Development Agency (AFD). It has a significant social component as it involves rehousing some 40,000 slum dwellers on the outskirts of Casablanca and modernising Moroccan schools. The EIB has also invested in climate action, which received over 30% of funding in 2015, contributing, for example, a total of €77 million to the wastewater processing plants project in Kafr-El-Sheikh, Egypt. Since the Arab Spring, the EIB has injected €4.4 billion into the economy of Southern Mediterranean countries. For the 2014-2020 period, the European Union set the EIB an ambitious target of €10 billion in loans for Mediterranean partner countries.